Yano Research Institute (the President, Takashi Mizukoshi) has conducted a survey on the domestic contract manufacturing market of soft drinks and has found out the market trends by area and by product, the trend of market players, and the future perspectives. Size of the beverage contract market in FY2016, based on the sales at contracted manufacturers, shrank to 562,300 million yen, 97.7% of the size in the previous fiscal year, but turned for the better in FY2017 to 102.3% of that of the preceding year to attain 575,500 million yen. The steep dive in FY2015 stemmed largely from the changes in the trading form at some large beverage makers (brand owners) from conventional product sales to processing expense sales, which caused sales decline at many of those contracted manufacturers (hereafter referred to as “packers”) that produce beverages for such brand owners. Since brand owners are currently focusing on in-house manufacturing, they plan to prioritize manufacturing at their own factories. In such a status, some increase or decrease in the beverage market does not sway the volume of products to manufacture at brand owners. Similarly, now that each brand owners have increased the ratio of in-house production, expansion of the beverage market does not directly increase the beverage contract manufacturing market, and vice versa, i.e., contraction of the beverage market does not directly decrease the beverage contract manufacturing market. In fact, however, the profitability of the beverage contract manufacturing business is largely affected by rise/decline in the beverage market size and by the ratio of in-house manufacturing at brand owners. The packers of beverage contract manufacturing can be divided into the following two types: Those that mainly undertake the business of large brand owners by proactively investing in facilities; or those mainly contribute to local communities including local governments and companies, instead of brand owners. From the beginning, the latter is required to produce small volume of beverages in order to satisfy the needs, so that enhancement of small-lot production has been inevitable. The former type of packers, too, has become indispensable to deal small-lot production, as some brand owners who minutely plan the supply and demand tend to break down the products to order into several categories. In addition, because large brand owners have introduced aseptic filling equipment, the packers cannot avoid considering adopting the equipment as well, in order for them to continue the business with the owners. This requires higher expenses than those at the packers dealing with local communities. On the other hand, some packers have started undertaking production of not only canned products but also the beverages in hot packs (i.e., PET containers that can contain hot beverages) and retortable pouches which use the filling methods that tend not to be invested by the brand owners. 2.Research Object： Beverage packers, beverage manufacturers who are brand owners, industry organizations, etc. What is the Beverage Contract (Packer) Market? 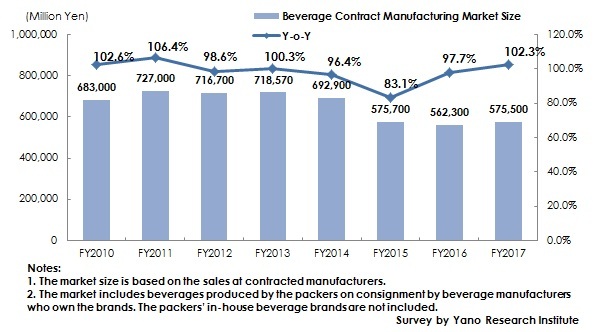 The beverage contract market in this research indicates the market of beverage production by the packers on consignment from beverage manufacturers who own the brands. The packers’ in-house beverage brands are not included. ©2019 Yano Research Institute Ltd. All Rights Reserved. The copyright and all other rights pertaining to this report belong to Yano Research Institute. Please contact our PR team when quoting the report contents for the purpose other than media coverage. Depending on the purpose of using our report, we may ask you to present your sentences for confirmation beforehand. Returns to the RESEARCH SUMMARY. Copyright(C) All rights reserved. Yano Research Institute Ltd.